The action continues all week in Troy. Brian Earley of the USTA presents Eric Hayes and the City of Troy with a plaque for 10 years of hosting the tournament. TROY, Ala., (Oct 14, 2012) – One of Canada's most famous exports, the legendary rock band Rush, hit the "top-10" in 1981 with one of their most famous songs, "Limelight." 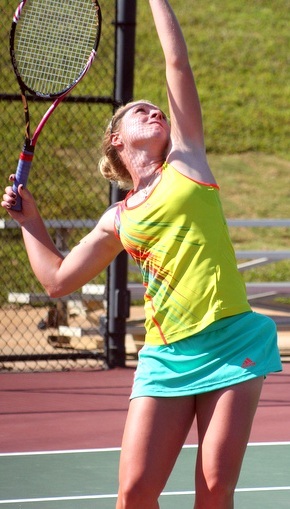 For two Canadians in Troy, Alabama on Sunday, they have ultimate goals of the "top-10" and "limelight", but first there was a singles final to play at the USTA Tennis Classic of Troy at the Lundsford Tennis Complex on the campus of Troy University. Stephanie Dubois and Sharon Fichman took to the court in Troy, with Dubois holding a 2-0 career mark in head-to-head matches and higher world ranking of 167 compared to Fichman at No. 198. The early stages of the first set featured the players trading breaks of serve until Fichman took command. Mixing in some drop shots with some slice approach shots, she took the first set 6-3. With Dubois going frequently to the towel to combat the 95 degree plus temperatures on the court, she gathered some early momentum in the second set to race out to a 3-0 lead. Fichman then found the range and stormed back to take a 4-3 lead. Dubois then fired herself up with some positive vocal instructions to pull ahead and take the second set 6-4. Dubois went ahead 4-3. Another break of serve allowed Dubois the chance to serve the match out and she did just that winning on an overhead smash 3-6, 6-4, 6-3. "I like playing here, the facility is nice and it's good to get my first tournament win of the year," stated Dubois following the match. 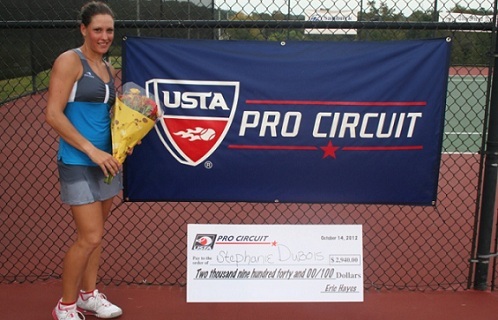 Stephanie Dubois is the 2012 champ at the USTA Tennis Classic of Troy. In Sunday's doubles final, Angelina Gabueva and Arina Rodionova of Russia defeated the Canadian pair of Fichman and Marie-Eve Pelletier 6-4, 6-4. "I love it here," stated top seeded Michelle Larcher De Brito of Portugal. "Great atmosphere and I don't mind playing here at all." "The City of Troy has been a proud sponsor and host of The USTA Women's Tennis Classic of Troy," stated Sheila Jackson, Director of PR and Tourism for the City of Troy. "The tournament has a huge impact on our community, the economic impact, the free clinics for the schools and the boys and girls club." "Troy gets "it"," said Brian Early, USTA Pro Circuit Director and U.S. Open Referee. "A tournament like this is important in the development of a tennis player." "Troy reminds me of my hometown, the people are wonderful and the tournament director does a lot for us," said Sharpsburg, Georgia resident Natailie Pluskota, who qualified in singles and won her first doubles match on Tuesday. "Troy is different, in a good way." USTA Tennis Classic of Troy Tournament Director and Head Coach of the men's and women's teams at Troy University, Eric Hayes was on NetcastStudio's "The Tech of Sports" last night talking about the tournament and his tennis team at Troy. TROY, Ala., (Sept. 25, 2012) – Since 2003, the best women tennis players in the world have been coming to Troy, Alabama to showcase their skills. This year, Brian Earley, the Director of the USTA Pro Circuit and U.S. Open tournament referee will be coming to Troy for the 10th anniversary of this USTA Pro Circuit event. 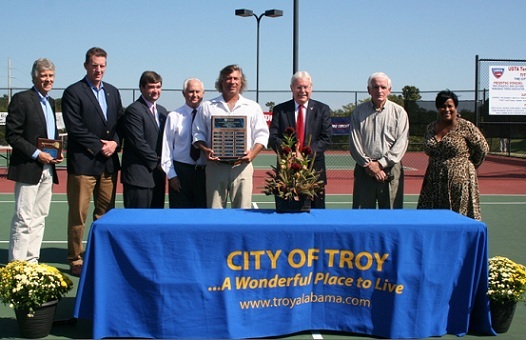 Earley is expected to award those responsible for the Tennis Classic of Troy, a plaque commemorating a decade on the USTA Pro Circuit at 2pm on October 8. Tennis fans know the name Brian Earley. He's the tall and thin gentleman carrying the walkie-talkie you see at the U.S. Open making decisions when it comes to pulling the players off the court due to inclement weather. Earley began his career at the USTA in 1979 when he became a USTA Pro Circuit Supervisor. He joined the USTA Referee Staff at the US Open in 1981, becoming US Open Tournament Referee in 1993, a role he continues to fill today. In 1997 he was promoted to Director, USTA Pro Circuit. In this role, Brian is responsible for overall administration of all developmental professional tennis in this country. In addition to his work on the Pro Circuit & US Open, Brian has been the Referee for at least one Davis Cup tie per year since 1991 and has done several high–profile events, such as Australia vs. France in Sydney in 1996 and Chile vs. Slovakia in 2006. It's a big honor for this world-class tennis event that is held in a small college town. Jackson also noted that the mayor and council of Troy are proud of this 10-year celebration and are looking forward to another great event. Over the years, Troy has played host to such players as Americans: Christina McHale, Melanie Oudin, Bethanie Mattek-Sands and Irina Falconi. Past champions include: Rebecca Marino (CAN), Alison Riske (USA), Anna Tatishvili (GEO) and Maret Ani (EST). Again in 2012, many of the top tennis players in the world will be in Troy for the the USTA Tennis Classic of Troy, Alabama, taking place October 6-14, 2012. "It's another great field," said tournament director Eric Hayes. Hayes is also the head tennis coach of the men's and women's teams at Troy University. Headlining the field in 2012 are Edina Gallovits-Hall, a Romanian living in Atlanta that has been ranked as high as No. 54 in the world and has won 18 ITF Circuit titles. Slated to be the No. 2 seed is Michelle Larcher De Brito from Portugal. De Brito plays an exciting brand of tennis and has been ranked as high as No. 74 in the world. Joining these two will be a group of young Americans looking for a title and breakthrough. These include Chi Chi Scholl, Grace Min, Shelby Rogers and Chieh-Yu Hsu. They are hoping that they can duplicate the results posted by the two singles finalists from 2011. Last year, Romina Oprandi of Italy defeated American Varvara Lepchenko in the finals, but both used Troy as a chance to improve their rankings and move on to bigger and better things in 2012. Lepchencko is one of the most improved players on the WTA Tour and she is now ranked No. 20 in the world. Oprandi also has tasted success in 2012 and she sits at No. 64 in the rankings released on 9/24/12. This tournament is unique in the fact that it takes place on a vibrant college campus and that it's an event that the entire community of Troy gets behind. "Every year we have a great field of competition from top to bottom," stated Hayes. "We have unprecedented media coverage throughout the tournament, and I would like to thank them and our fans for putting our event on display." As with any USTA event, the kids are always included. The tournament offers $25,000 in prize money to the singles and doubles players and a 64-player qualifying tournament will take place during the opening weekend of the tournament. Wildcards will be given out leading up to the start of the main and qualifying draws and they will join those that survive the qualifying tournament in the main draw with the 20 players that gained direct entry. 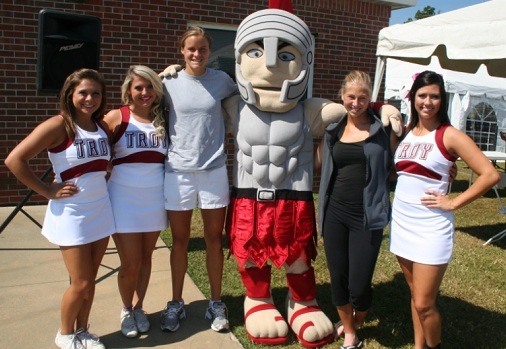 There will be a lot of tennis to be played the second week in October in Troy. Quite a few of these players have the potential to be the next stars in women's tennis and Troy could once again be an important event on the fall tennis calendar. The USTA is the national governing body for the sport of tennis in the U.S. and the leader in promoting and developing the growth of tennis at every level -- from local communities to the highest level of the professional game. A not-for-profit organization with more than 785,000 members, it invests 100% of its proceeds in growing the game. It owns and operates the US Open, the highest attended annual sporting event in the world, and launched the Emirates Airline US Open Series linking 10 summer tournaments to the US Open. In addition, it owns approximately 90 Pro Circuit events throughout the U.S, and selects the teams for the Davis Cup, Fed Cup, Olympic and Paralympic Games. The USTA philanthropic entity, USTA Serves, provides grants and scholarships and helps underserved youth and people with disabilities. For more information on the USTA, log on to usta.com, “like” the official Facebook page facebook.com/usta or follow @usta on Twitter. in cities nationwide. Mardy Fish, Maria Sharapova, Andy Roddick, Caroline Wozniacki, John Isner, Li Na and Andy Murray are among today’s top stars who began their careers on the USTA Pro Circuit.